We leave so we can return, and in the process we are changed. I spent the last night of 2017 alone in New Orleans. My friend Rebecca invited me to stay at her place while she was gone, and I said yes. At midnight on New Year’s Eve, I stood silently on the balcony of her apartment with champagne in hand and watched fireworks ascend from the Mississippi and hang over the city. On the first day of the year, I woke sans hangover, made tea, and listened to older episodes of On Being. Krista Tippett’s interview with the poet David Whyte especially resonated with me. They talked about aloneness and solitude, and he recited a few of his verses. I need to pick up his book, Consolations, I thought to myself as I finished getting ready for the day. It felt intentional, resolute, and, yes, vulnerable. It felt like the year I had experienced, a year in which I often wondered if the space between who I was and who I was becoming might swallow me up — but here I was, still breathing. I liked Krasner’s piece more than Pollock’s, which hung protected by plexiglass while Krasner’s was uncovered, open, free. 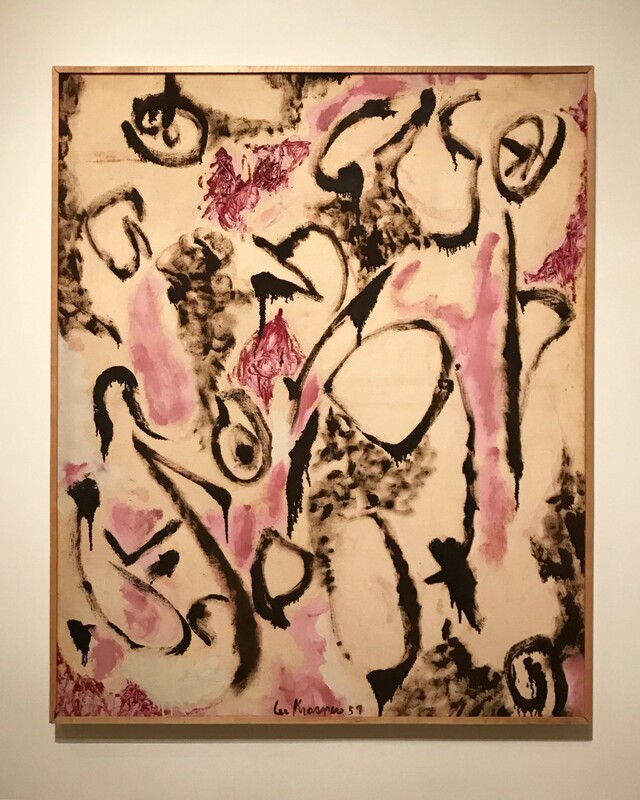 Breath’s warm pink hues delicately danced around the canvas and it had something Pollock’s painting did not: space and distance between the closeness. It felt intentional, resolute, and, yes, vulnerable. It felt like the year I had experienced, a year in which I often wondered if the space between who I was and who I was becoming might swallow me up — but here I was, still breathing. Lee was part of a partnership that became iconic, and rightfully so, but I wondered how she might feel about her work displayed alongside her husband’s if she were here. Would she smile and be proud? Would she yearn to stand alone, outside of the context of a partnership with a man whose work and personality seemed, to me, to cast a shadow over her and relegate her to the status of a “woman painter?” I wondered because I have asked myself the same questions, only I am here, alive, and I can answer. I know what it’s like to be in a partnership that takes on a life of its own, albeit much less iconic than the Pollock-Krasner pairing. Nonetheless it can often become unclear where one ends and another begins. It is easy to forget that relationships are intended to be a dance between togetherness and separateness, and it’s harder to remember and practice that dance when your life partnership extends into business, as mine did. Pollock and Krasner met in 1942 after exhibiting together, and they married in the summer of 1945 in Springs, New York. I met Ryan in Michigan in the spring of 2005 and we were married in June of the following year. Our partnership lasted for more than a decade before it ended in January 2017. For a time, our work hung next to each other’s, and I am both proud of what we created side by side and ready to hang my work alone. It may be that time away from a work, an idea of ourselves, or a committed partner is the very essence of appreciation for the other, for the work and for the life of another, to be able to let them alone as we let ourselves alone, to live something that feels like a choice again, to find ourselves alone as a looked for achievement, not a state to which we have been condemned. This is why I traveled alone to New Orleans. I wanted to bask in solitude in an unfamiliar city, surrounded by strangers. I wanted to walk past historic buildings, listen to jazz, and eat copious amounts of delicious fried food by myself. I wanted to remember who I was, remind myself of who I am, and imagine who I might become. We leave so we can return, and in the process we are changed. Sometimes we go back to the same lives, the same work, the same lovers. And sometimes we go back to an altogether different life. We leave so we can return, and in the process we are changed. Sometimes we go back to the same lives, the same work, the same lovers. And sometimes we go back to an altogether different life. The life I live now looks vastly different than it did last January, but over the past twelve months I’ve grown to have gratitude for both the togetherness I experienced and the solitude that will welcome me home. *Read the follow-up companion piece, Finding Solitude in Togetherness, here.